Peekskill, NY In a major commitment to the revitalization of the downtown area, Ginsburg Development Companies (GDC) joined with mayor Andre Rainey and deputy county executive Ken Jenkins and other city and county officials to celebrate the grand opening of Gateway Townhomes. GDC is its own general contractor. GDC’s in-house architectural department was the design architects, with Appel Design Group of Livingston, N.J. as architect of record. 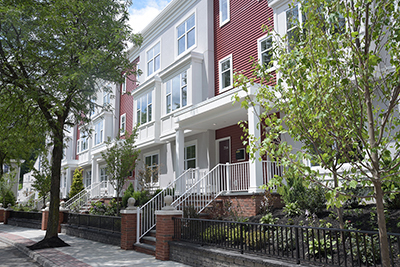 Located at the “Gateway” to Peekskill at 700 Main St., Gateway Townhomes is the first new construction in this area of Main St. in 65 years. The $5.2 million development features 16 rowhouse townhome-style condominiums with a selection of triplex three-bedroom homes ranging in size from 1,756 s/f to 1,915 s/f. The first floor of each townhome features an entrance hall, home office/guest room and a two-car garage. The second floor consists of the living and dining rooms with a large eat-in kitchen, with the top floor featuring two or three bedrooms. The townhomes are within an easy walk to downtown restaurants and shops. Residents of Gateway Townhomes will share a shuttle bus to the Peekskill Metro-North Station with GDC’s nearby Fort Hill development which is under construction. Ribbon cutting of Gateway Townhomes. “The Peekskill we dream of still lies ahead. Housing, power, water and sanitation for all; bank accounts and insurance for every citizen; connected and prosperous, smart and sustainable cities. The Gateway is one of the first projects that welcomes this dream come true,” said Peekskill mayor Andre Rainey. “This wonderful new residential development will provide an attractive gateway to the City of Peekskill which is undergoing an exciting renaissance. We are particularly pleased to offer reasonably priced condominium living that is convenient to Downtown Peekskill and its many great restaurants and shops. We look forward to continuing our commitment to Peekskill’s revitalization with the grand opening soon of our new Fort Hill Apartments development which is just up the road from this project,” said Martin Ginsburg, principal of GDC. 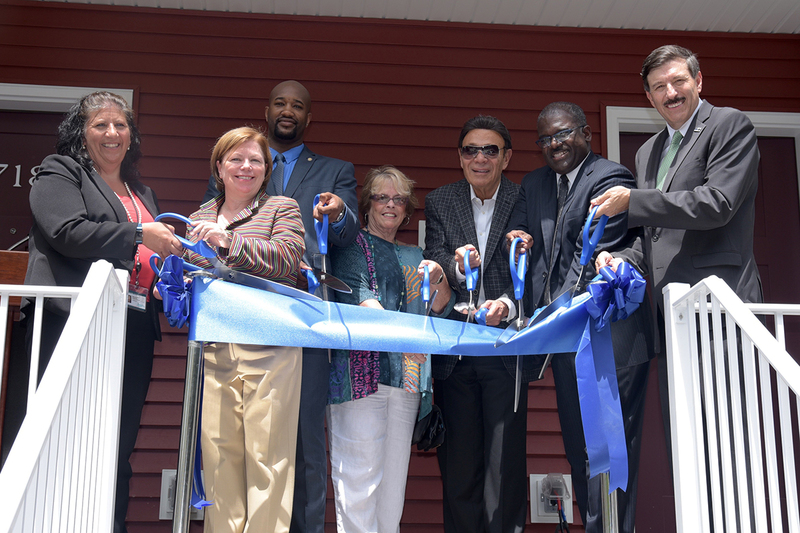 Joining the grand opening ceremony were several county officials including deputy county executive Ken Jenkins, deputy director of Economic Development Bridget Gibbons, county department of planning commissioner Norma Drummond and county legislator John Testa. Westchester County assisted the city in purchasing the site prior to GDC’s involvement in the project. With the completion of Gateway Townhomes, GDC is moving ahead with a grand opening in September of the first phase of Fort Hill Apartments at the Abbey Inn. Located on Fort Hill Road in Peekskill, the $64.5 million mixed-use project is transforming the former St. Mary’s convent property into a resort-style tourist destination featuring luxury rentals apartments as well as a spa, inn and restaurant.